How deep is your humanity? Nelson Mandela was committed to the ideal of all people living together in harmony with equal opportunities. He was willing to sacrifice for others and was prepared to die for that struggle. In this day and age injustices still abound and it is not enough to be a “free bystander.” Be a champion of freedom. Lift the perception of differences and avoid buying into judgments based on stereotypes. We are all distinctly human regardless of gender, race, religion, sexual orientation or capacity so speak up for the oppression of all people. If your workplace is not wheelchair accessible, say something even if you are able-bodied. If you’re in a group and someone disparages a gay person, stop the conversation and call it out. 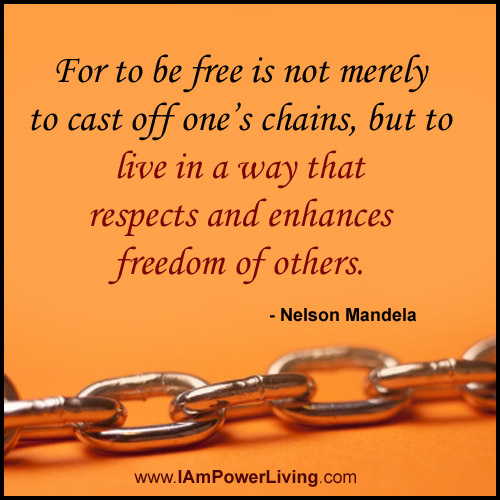 As Mandela said, “freedom is indivisible.” Chains on any one person are chains on all of us. Gallery of Nelson Mandela Quote Cards.